Sometimes, the simplest things are needed to entertain your toddler. This bin was requested by Skimmer (2.5) and he played for a long time. 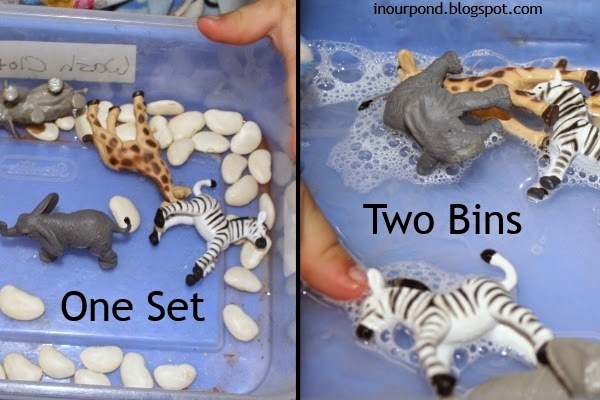 When I first set it up, I gave him six animals (pairs of giraffe, elephant, zebra) and a small handful of beans. The beans became food for the animals in his pretend play and he also enjoyed matching up the animals into families (mommies and babies). After he tired of playing in the dry bin, I asked him if he'd like to wash his animals. The second bin had a half inch of warm water and a dot of dish soap. When he was finished playing, he set the tray on the table and asked me to get him down out of his highchair. That method was a big improvement over his previous one of just dumping the bin when he was done with it. He's growing up. Today he was running his truck up my arm. "Up a hill," he exclaimed. Then, he pushed it back down my arm. "Down the hill." He was pretty excited with the opposite phrases he had just stated. "Up. Down," he repeated several times, as if solidifying it for himself. I love watching my kids learn new things. This is why I do Mommy School.